Yesterday, the Supreme Court heard oral arguments in Janus v. AFSCME, an attack by wealthy, anti-union organizations on the voice of working people and their ability to negotiate collectively. People from around the country rallied at the Court to let the world know that, regardless of the outcome of the Janus case, we will continue to organize for the public good and for our rights. This followed the Working People’s Day of Action over the weekend, which called attention to our rigged economy and the need to defend our rights at work. It marked the fifty-year anniversary of protests by Memphis sanitation workers and Dr. Martin Luther King Jr. against discrimination, low pay, and inhumane conditions that led to worker deaths. Share the graphic below on Facebook and spread the word. 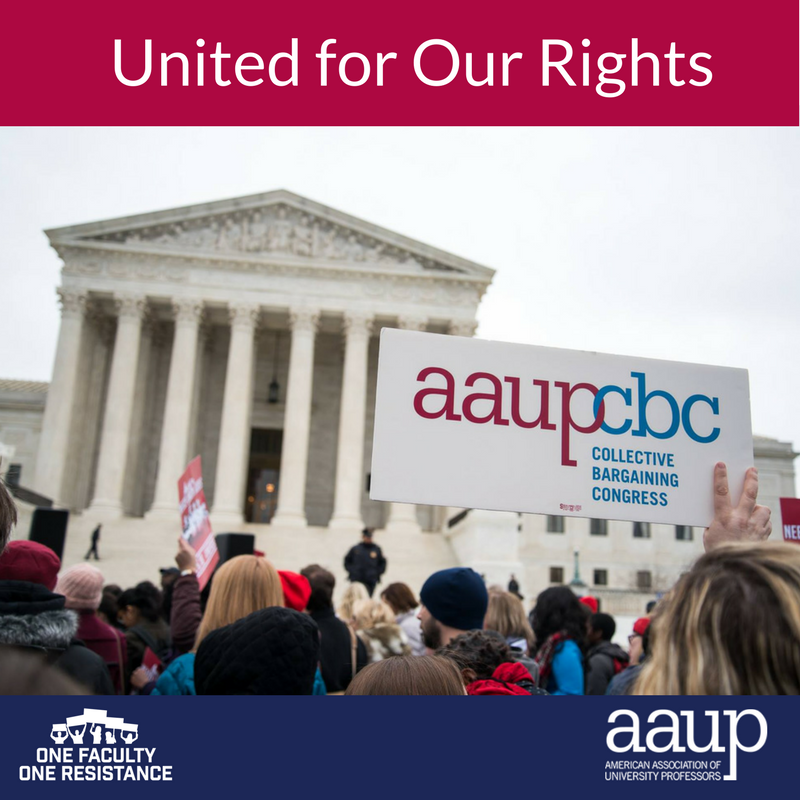 The AAUP supports the right of working people, including faculty, to join together in unions as well as in traditional nonunionized AAUP chapters. Our collective voice is a powerful force to set standards and create better workplaces. Together, we fight for higher education and the critical role it plays in this country. Together, we defend academic freedom, shared governance, and due process protections. Standing together also makes it possible for us to negotiate affordable healthcare, a fair return on our work, and the ability to retire with dignity. At issue in Janus is whether non-union members, who share in the wages, benefits, and protections that have been negotiated into a collectively bargained contract, may be required to pay their fair share for the cost of those negotiations. Learn more about the Janus case and the amicus brief we filed. Yesterday’s oral argument went largely as expected. Many of the justices sharply questioned the attorneys. Justices Sotomayor, Breyer, Ginsburg, and Kagan generally asked questions and advanced arguments that were supportive of the constitutionality of fair-share fees, pointing to their benefits and to the fact that unions and others had relied on the prior decisions of the Court. Justices Kennedy, Alito, and Roberts took the opposite approach. Justice Kennedy seemed particularly hostile, asserting that unions compel nonmembers to subsidize their political speech. Because none of the justices appeared to depart from their expected position, today’s oral argument reinforced the view that the Court will rule against us. AAUP members are sticking together as One Faculty, One Resistance to fight for our collective voice, to promote safe and challenging learning environments, and to defend the important role our universities play in advancing the public good. Categories: comments | Tags: academic freedom, anti-union, due process protections, Janus v. AFSCME, shared governance, Supreme Court, Working People’s Day of Action | Permalink. Since its founding in 1915, the AAUP has sought to ensure meaningful faculty participation in institutional governance. The AAUP’s Committee on College and University Governance joins the growing chorus of voices denouncing President Cross’s ill-judged remarks and calling on him to explain them. The committee further calls on President Cross to work actively with faculty, staff, and students on developing policies and practices that will restore a meaningful and productive system of shared governance. The AAUP will continue to monitor the situation in Wisconsin. Categories: comments | Tags: higher education, public good, Scott Walker, shared governance, University of Wisconsin | Permalink.